Being a part of the Summer Crew truck team has been a fun and enjoyable learning experience for me. Riding with truck team is like getting a free tour of the city. I get to visit every ward and see what common trees are in different neighborhoods. I have discovered how beautiful and unique Washington D.C. is and how it is changing. I have seen beautification of areas that have been ignored until recently. 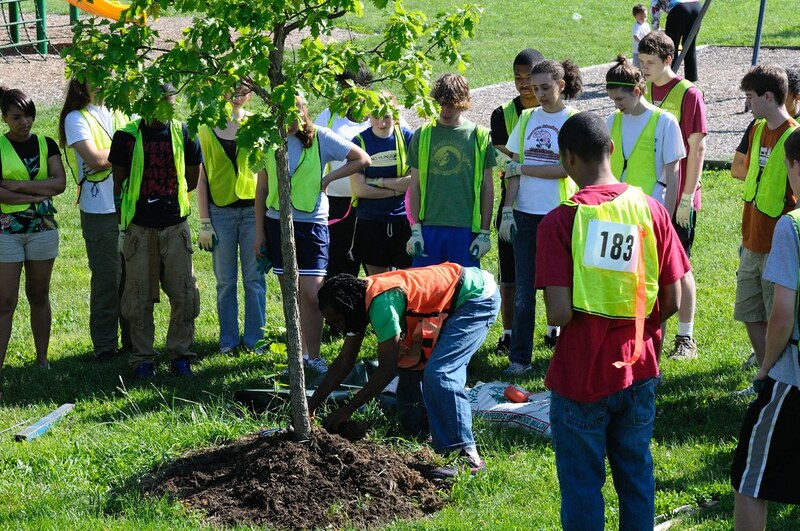 For example, closer to my own neighborhood we are watering trees: a mix of cherry trees and river birch at Ballou High School as well as oaks and crabapples at Congress Heights Park (both places that our tree planting crew has planted trees this past April). I play a major role in Summer Crew operations as a co-pilot of one of the two Casey Trees trucks assisting Ed Bell on his famous "bucket brigades." 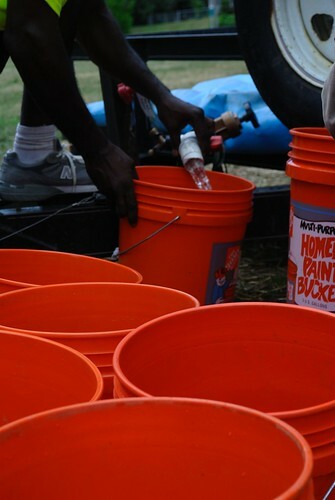 I manage the flow of water from the truck’s bladder, which holds 500 gallons of water, to the buckets. I fill buckets and move them into a receiving line for the students while trying to reduce spillage. When one of our water tanks malfunctioned, I improvised a method to dip the buckets and scoop water out of the tank. Filling up buckets from the truck's water bladder. I also help the crew chiefs navigate the eight wards of the District to water all of the trees we planted. We have tree maps as a guide to our watering routes. The maps are pretty informal - they include the location of the trees and the maps’ color coding helps us prioritize what trees need water the most. It has been our goal to water red dots on the maps (trees planted in the last year) four times. The maps also indicate where fire hydrants are so that we can refill the truck's water bladder. Jabbari demonstrates best maintenance practices to prospective Summer Crew members. Overall, it has been a very intense, hot summer, which added a significant challenge to the already difficult work. One the hottest days had to be July 22 when the heat index was close to 115. We had to stop early because it was too hot, yet we watered enough trees to satisfy our goal for the day. I also help engage the Summer Crew students in their work and try to make it meaningful to them by teaching the students tree identification. I hope that the students leave Casey Trees feeling connected to trees, and I believe knowing a tree’s name helps build that connection. As we water the trees I know we all have come to appreciate them more, especially the shade they provide us for a cool lunch spot on a 90 degree summer day.